So argues marine archaeologist Michael Flecker discussing the looting of perhaps the most significant shipwreck found in modern times. The wreck was discovered in 1998 by local fishermen while diving for sea cucumbers and was packed with some 60,000 glazed bowls, ewers and other ceramics. 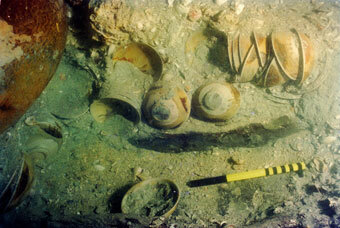 They were found in the wreck of an Arab dhow on its way from China to the Persian Gulf some 1,100 years ago. The Indonesian government did little to prevent the fishermen for taking objects from the cite and moved to hire Seabed Exploratiosn, a commercial salvage company to excavate the site, with the assistance of Flecker, who has published the excavation. Archaeologists now are criticizing the exhibition of this material at the Smithsonian, claiming the commercial salvage amounts to looting. Kimberly Faulk of the Advisory Council on Underwater Archaeology says: “They were not excavated properly. They are indeed looted artifacts that were sold for profit,” which “sends a message that treasure hunting is OK.” That seems a very impractical stance to take. No one would argue that a concerted and extensive archaeological excavation would have been the best resolution here, or even if the Indonesian government had been able or willing to police the site of the wreck. yet short of those options, a removal of the objects with archaeologists yields some information right? What should be done with the objects now according to the archaeologists? What kinds of information might a longer extended excavation have recovered? I’d be interested in comparing the scientific results of this excavation with other more rigorous studies? I mean, what should happen, should the 60,000 objects be returned to the ocean floor? Is there really no value in these objects without the context? If the advocates are using this for a chance to raise the profile of the problem of conservation and excavation of underwater archaeological sites, that seems a worthwhile endeavor, but doing so at the expense of common sense solutions seems to diminish their cause. Elizabeth Blair, From Beneath, A Smithsonian Shipwreck Controversy : NPR, http://www.npr.org/2011/05/04/135956044/from-beneath-a-smithsonian-shipwreck-controversy (last visited May 6, 2011).